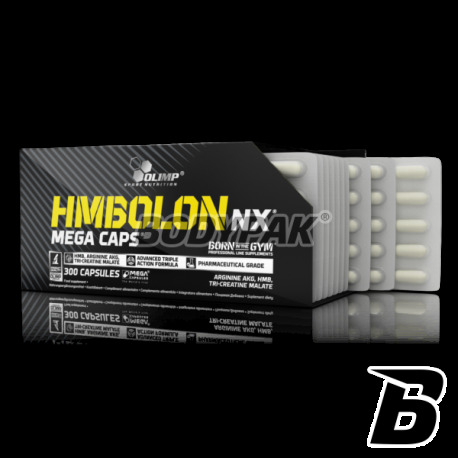 HMBOlimp HMBolon NX - 30 kaps. AAKG HMB + + Malate Creatine - according to the manufacturer: 300% more lean muscle mass, a 200% increase in body fat reduction. According to consumer feedback - feel good effect, you will see results! It is worth a try. 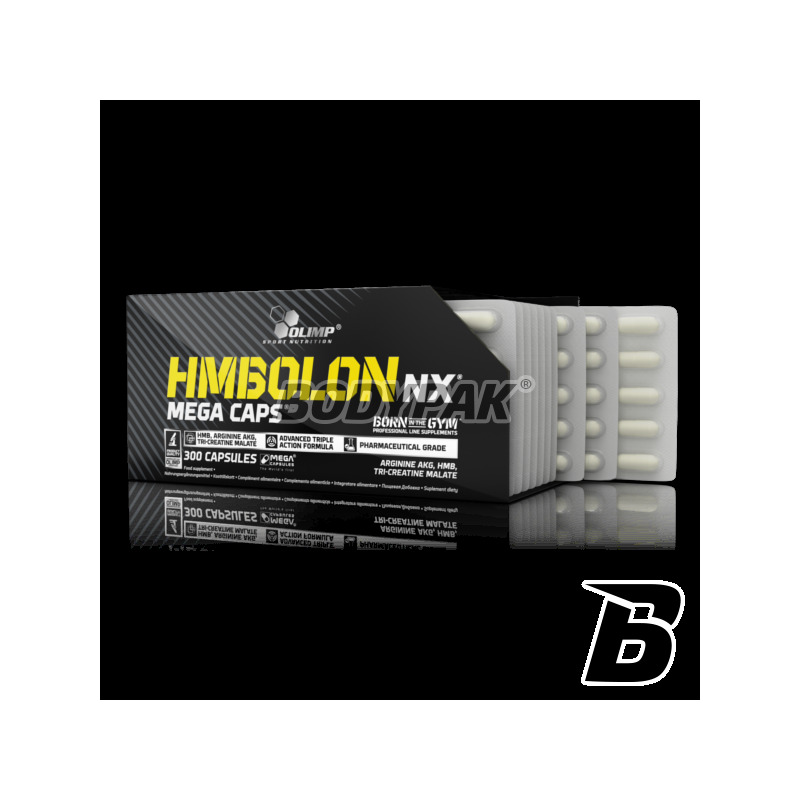 Olympus HMBolon NX® - is an advanced preparation supplementing the diet with calcium hydroxy methylbutyrate, developed in close conjunction with arginine alpha ketoglutarate and creatine malate, reinforcing effect of HMB. Hydroxy methylbutyrate (HMB) facilitates the development of strength and lean muscle mass. Research has shown that its activity is significantly increased in the presence of creatine and arginine. Synergism occurring between these nutrients can be explained by their participation in the different stages of the same metabolic pathways that lead to the reduction of subcutaneous fat and accumulation of muscle protein. 1. HMB inhibits the activity of catabolic enzymes, destroying muscle proteins. In the same way also acts arginine and other free amino acids. HMB, however, is very active in this field, as due to the presence of the methyl group in the molecule inhibits the enzyme strongest. Arginine effect on the acidity of the cellular environment in such a way that the catabolic enzymes can not destroy the protein. Creatine prevents the penetration of these enzymes to the muscle proteins. At the same time it eliminates free radicals, or molecules that destroy the protein together with enzymes. 2. HMB affects the production of the anabolic steroid hormones as a source of isoprene units. Isoprene units are the same building blocks of hormones, such as amino acids, the building blocks of proteins. Creatine phosphate supplies bogatoenergetycznych to the individual stages of production. The hormones stimulate the process of accumulation of protein in muscle cells. The rate of accumulation is, however, dependent on the amount of phosphate dowożonych by creatine. Arginine herein provides polyamines and cyclic nucleotides, supporting the work of anabolic steroid hormones. Production of polyamines and cyclic nucleotide is further dependent on the activity of creatine. 3. HMB inhibits the binding of sugars with fatty acids, ie the production of fat storage. Arginine facilitates the breakdown of stored fat into sugars and acids. With producible nitric oxide from arginine, sugars and fats turn to the combustion processes in the muscle cells. As a result of combustion formed by high-energy creatine phosphate transferred to the contraction of muscle fibers and anabolism. 4. Arginine may be converted by the body into creatine. For the conversion of the methyl groups are needed. It is caused, inter alia, HMB. When converting arginine into creatine body can benefit from methyl HMB may be transferred between the compounds through the active methionine. 5. Alpha ketoglutarate (component arginine alpha ketoglutarate), malate (component creatine malate) and HMB are among the few compounds whose chemical energy is immediately transferred to a high-energy phosphates, then transported by creatine to the contraction of fibers and protein anabolism. Malate can behave. It is also the same as creatine phosphate or isolated move to these processes. Alpha ketoglutarate also increases the conversion of arginine to nitric oxide anabolic which further together with creatine phosphate and is responsible for the possibility of power muscle fibers. It inhibits the activity of catabolic enzymes. It stimulates the production of anabolic hormones. It is involved in the conversion of arginine to creatine. Blocks supply of sugar to produce fat storage. In this way facilitates the development of strength and lean muscle mass. How it works strengthens arginine? produces polyamines supporting the work of anabolic hormones. It increases the production of cyclic nucleotides, which stimulate protein anabolism and break down fat reserves. undergoes transformation in anabolic creatine. How the action of arginine, HMB and creatine strengthens? Provides bogatoenergetycznych phosphate to the protein anabolism. It is involved in the production of cyclic nucleotides, which stimulate protein anabolism and break down fat reserves. Allows burning of stored fat ingredients with the acquisition of power to operate. Składniki: β-hydroksy-βmetylomaślan wapnia, alfaketoglutaran argininy, jabłczan kreatyny, stearynian magnezu - substancja przeciwzbrylająca, żelatyna - otoczka kapsułki. Ciekawe połączenie HMB i AAKG, w końcu mam to w jednej kapsułce i nie muszę łykać osobno, to jest coś czego szukałem!